Marketed as the Swiss Army knife of coffee makers, Ninja makes makes some pretty big claims about its multi-functional brewer. Unsurprisingly, Ninja Coffee Bar reviews around the web are quick to praise its do-it-all functionality. And it’s true that the this coffee bar does a lot. Supposedly it’ll allow you to replace your coffee maker, espresso machine and any iced beverage contraption you may have with one reasonably compact system. But is it possible the Ninja Coffee Bar system does so many different things that it’s incapable of doing any of them well? That’s what I wanted to find out. 6 How Does the Ninja Coffee Bar Work? 8 Is the Ninja an Iced Coffee Maker? 9 Does the Ninja Coffee Bar Make Espresso? 10 How Good Is the Ninja Coffee Bar Frother? 13.1 Who would prefer the Ninja Coffee Bar? 13.2 Who would prefer a Keurig? 14.1 Who would prefer Ninja Coffee Bar? 14.2 Who would prefer a Nespresso? First, let’s get this one out of the way: Yes, this is the Sofia Vergara coffee maker you’ve seen in the commercials, and in the commercial below Sofia plays with the heart of a barista she has seemingly broken up with for her new love: the Ninja Coffee Bar. The Ninja Coffee Bar System is a versatile do-it-all system that (mostly) does it all. In the intro I expressed concern that Ninja’s attempt to create a single machine that could make hot coffee, iced coffee and specialty beverages would compromise its ability to do any of them well enough, but that’s just not the case. The Ninja will please most discerning coffee drinkers with each of its Auto IQ powered brews. All of this versatility comes in a pretty affordable package, but that means you’re getting a lot of plastic components. 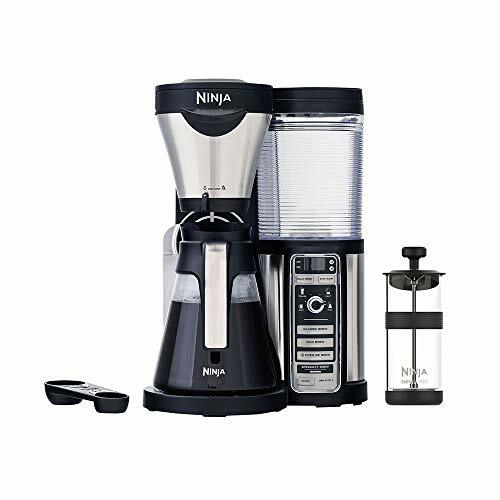 Overall, though, Ninja is a proven leader in the kitchen appliance space and I have little reason to expect this Coffee Bar System to fail any faster than a similarly priced coffee maker from another manufacturer. How Does the Ninja Coffee Bar Work? How does this amazing system brew all of Sofia’s favorite coffee beverages? This has to be some newfangled technology, a Frankenstein combination of drip, french press and espresso brewer, possibly with a dash of voodoo magic. Actually, the Ninja Coffee Bar is your standard drip coffee maker with a conical filter. Most models come with a permanent mesh filter, but it’s also compatible with number 4 conical paper filters, too. It’s connected to your typical water reservoir and has a push-button interface that allows you to choose your settings. That push-button interface is the secret to the Ninja’s versatility: It’s the portal to the Ninja Coffee Bar Auto IQ technology. Choose a size. Choose a brew. Enjoy your cup. With the Ninja Coffee Bar Auto IQ system, the brewer will measure out the proper amount of water for the size and strength you select. For example, let’s say you want a specialty brew of concentrated coffee. If you select the single cup size the Auto IQ system will portion out enough water for 3.1 oz of concentrate. If you switch to the travel mug size, Auto IQ will measure out for 4 oz of concentrate. This feature is at the core of the Ninja Coffee Bar’s multi-functional performance. For your reference (because they aren’t stated anywhere I could find — I had to read the manual) these are the default brew sizes on “Classic” brew. All other brew types will be more concentrated brews and thus be small volumes. The Ninja Coffee Bar comes in a couple different models, but the core system is the same with each of them — the difference is some of the extras thrown in. The unit measures 15″ tall, 10″ wide and 11″ deep, so it’s a little bit bigger than most home brewers, especially in height. Make sure it’ll fit somewhere on your counter top. What’s nice is that the Ninja does’t require much access to the top. You’ll need a few inches of clearance to remove and refill the water reservoir, but the ground coffee holder pulls outwards instead of upwards. The unit does come with a couple extras — a small scoop, a permanent conical filter and a hand pump frother (with some models). You’ll need to have storage space for these, too. In this review I want to spend the majority of the time talking about the first two models shown — CF080Z and CF085Z — but let’s touch on each quickly. This model and the CF085Z below are the same with the exception of the carafes. The CF080Z comes with the thermal carafe.This review focuses primarily on this standard model but applies to the other models as well. This model and the CF080Z above are the same with the exception of the carafes. The CF088Z comes with the glass carafe. This review focuses primarily on this standard model but applies to the other models as well. A step up from the CF080Z and CF085Z, the CF097 features a couple extra brew sizes, a stronger “Cafe Forte” setting and comes with a built-in frother that can be used to froth both hot and cold milk. It also comes with the thermal carafe and a 50 oz iced coffee pitcher. This is the best model and comes with the most accessories. The outlier of the 4 Ninja models, the CF112 also has the “Cafe Forte” setting and can brew the XL Cup and XL Multi-Serve sizes (just like the CF097 above), but it doesn’t have carafe compatibility and thus can’t brew the half or full carafe. The Thermal Carafe System comes with a 43 oz double-walled, vacuum-sealed, stainless steel thermal carafe which will keep the coffee hot for up to 2 hours. The Glass Carafe System comes with a 43 oz glass carafe. Unlike the Thermal Carafe System, the Glass Carafe System also comes with a warming plate. Ninja has engineered the warming plate with a pretty cool feature — their Precise Temp Technology. The name is just a fancy way of saying they adjust the temperature of the warming plate depending on the volume you brewed — single cup and full carafe will have different temperatures. For anyone who’s burned their coffee on an overly hot warming plate, this is a simple but much appreciated feature. Both carafes come with a brew-through lid, which looks like a funnel and ensures that you get a consistent pour from the first to the last — no single cup should be stronger or weaker than any other. Is the Ninja an Iced Coffee Maker? Sort of. It’s not going to brew a cold beverage, but the Auto IQ’s “Over-Ice” setting will make a coffee concentrate to be brewed over ice. The coffee will melt the ice, diluting the coffee to the optimal iced coffee concentration, and then you can top off with ice to get it nice and cold. From experience I can say this actually does work — the iced coffee is not overly diluted. If I’m picking nits, one complaint I have making iced coffee from home is that even when you can make coffee that isn’t too dilute, the required melting of ice cubes with a hot coffee concentrate leaves tiny ice cube shards that haven’t yet fully melted. That’s still going to happen with this system. Like I said, I’m picking nits, but it’s worth mentioning that you’re still making iced coffee by combining hot (concentrated) coffee with ice. Is the Ninja an iced coffee maker: Yes, you can make iced coffee by mixing a hot coffee concentrate with ice. Does the Ninja Coffee Bar Make Espresso? Like the iced coffee method above, Ninja’s Auto IQ technology enables it to brew an even more concentrated, espresso-like coffee drink for use in cappuccinos and lattes by selecting the “Specialty” brew setting. Ninja is smart in avoiding the word “Espresso” and instead calling it “Specialty” because the result isn’t a true espresso. But still, Ninja does say they can make a coffee concentrate that’s espresso-like. Can a drip brewer actually do that? Espresso makers are able to make coffee concentrates because they mix coffee grounds and water under pressure. Industry consensus is that espresso should be brewed at 9 bars of pressure, though some home espresso makers will advertise 15-19 bars of inconsistent pressure. Drip brewers, like the Ninja Coffee Bar System, aren’t able to generate anywhere near the required pressure. How espresso-like will their “Specialty” brew be? Instead of just running the requisite volume of water through the grounds, the specialty brew setting pre-infuses the coffee grounds with water for optimal extraction. The process takes around 60 seconds but the result is rather impressive. This is a strong coffee concentrate. It’s not an espresso with rich crema, but Ninja’s pre-infusion and water volume control through Auto IQ are able to get as much extraction as could be expected from a drip brewer. Does the Ninja Coffee Bar Make Espresso? No, but it makes something pretty darn close that will do just fine in your cappuccino or latte. Click here for a primer video on espresso bar pressure. How Good Is the Ninja Coffee Bar Frother? The french press-looking frother is microwave safe, so you can do everything in that one vessel. And for about 5-10 seconds of aeration, I was surprised with how much air was incorporated into the milk. When poured into my cappuccino mug I was able to get about 1.5″ of light foam on top of 2″ of hot milk. How good is the Ninja Coffee Bar frother? It’s definitely not as good as a steam frother, but the Ninja Coffee Bar frother performed admirably and gets you very close to coffee shop quality. Given the system’s price and simplicity, I’m impressed. “The best coffee house in town is now on your counter top.” That’s what Ninja advertises with their Coffee Bar, and it’s a big claim because my local coffee shop has an entire chalkboard of different coffee recipes. Seemingly up to the challenge, Ninja produces a recipe book of 100 different coffee drinks you can create using their product. A simplified version of this recipe book comes with the system, providing you with 20 or 40 different recipes depending on the model you purchase. The full recipe book can be purchased on Amazon for under $20. What’s in the full book? It starts with a foreword by Sofia Vergara, including 20 of her (or her publicist’s) favorite recipes plus 80 additional recipes that run the gamut from simple hot coffee beverages to hot specialty drinks to chilled or iced specialty drinks. With 100 included recipes it touches the surface on a lot of different applications of the Ninja Coffee Bar, and it’ll show you a lot of Ninja-approved methods to maximize their product. Let’s take a look at one of the more popular recipes in the book: The Ninja Coffee Bar Cappuccino Recipe. Many people will have to choose between the Ninja Coffee Bar and a Keurig single serve brewer. How do the two compare? The biggest difference is that the Ninja Coffee Bar does not use K-Cups or pod coffee of any kind. It has a standard conical filter that’s compatible with ground coffee only. I mean, you could open K-Cups up and pour the contents into the Ninja, but that would just be hugely wasteful! The Ninja Coffee Bar provides affordable flexibility. It isn’t a pod brewer — that’s the first major differentiator — but most of today’s Keurigs come with the My K-Cup reusable pod attachment, which makes them compatible with all homemade or pre-ground coffee. Plus, with the exception of the Keurig Rivo, Keurig brewers are limited to standard or rich brewed coffee and don’t branch out to more concentrated offerings. They also don’t come with frothers, either hand-pump or built in. If you want the ability to make either non-diluted iced coffee or espresso-style beverages with frothed milk, the Ninja Coffee Bar is the better choice. While the Ninja is the better choice for iced coffee and espresso-style beverages, for basic coffee the Keurig is still the simplest to use — just pop in a pod and select your brew. With Keurig machines there’s no measuring out your grounds, and I happen to think Keurigs make coffee that’s a little bit hotter than what the Ninja offers. Similar to the Ninja Coffee Bar vs Keurig debate above, Ninja vs Nespresso first comes down to pod preferences. Nespresso has their convenient capsules, and the Ninja is a grounds-only brewer. Nespresso’s many machines, like the Nespresso Pixie, are also true capsule espresso machines. That means they actually come with the technology to brew with the proper bar pressure to make what can rightfully be called an espresso and not an espresso-like concentrate. Who would prefer Ninja Coffee Bar? The Ninja Coffee Bar is better for people who want a lower cost of maintenance. Nespresso capsules run about $0.85 per capsule, which really adds up. Ground coffee with your Ninja will save you a lot of money over the long haul. Who would prefer a Nespresso? True espresso lovers might want to go with a Nespresso machine that will brew a proper espresso with a rich crema. You can still add hot water to make an Americano or brew over ice to get an iced coffee. Not all Nespresso machines come with a frother, manual or otherwise, so choose your model carefully. Click here to download the user manual for the Ninja Coffee Bar CF080Z. No home appliance comes completely hassle free. Below is our quick troubleshooting guide. Why is my Ninja not dispensing the proper amount of coffee? The first thing to check is that you selected the proper settings. For example, the small cup setting could have 4 different brew sizes depending on the brew type you select. My coffee isn’t hot enough. This is a super annoying feature of the Ninja, which probably exists in almost all brewers but is more obvious in this one. It takes one full brew to heat up all of the Ninja’s components, which means the second and third brews are hotter than the first. To help your first brew be hotter, remember that you may be losing heat to your coffee mug. Try pre-heating your mug with hot water as this will help your coffee retain its heat. My coffee is taking forever to brew. The Ninja is a pretty slow brewer. The single cup size takes around 4 minutes, which is an eternity in the single serve game, and the full carafe takes about 8 minutes. If it takes longer than this, try running a descale cleaning cycle. Why is my Ninja beeping? If you hear beeping after pressing the brew button, check to make sure the drip stop valve at the base of the brew basket is open. If it is, check to make sure the basket is pushed all the way in. What’s wrong with the delay brew function? Similar to above, make sure the drip stop is open and the brew basket is pushed all the way in. Also note the delay brew function will cancel if you brew another cup before the delay brew begins. Why is the clean button lit up? It’s time to descale. You can find a cleaning video for your Ninja here. My coffee is too strong/weak. Because the Ninja isn’t a pod-based brewer, you’re allowed to change the coffee grind volume and grind size. If your coffee is too strong, try less coffee grounds or a coarser grind. If your coffee is too weak, try the opposite. The permanent mesh filter is leaving sediment in my cup. This is pretty common with the permanent filter as it has a different filter makeup than the paper filters — stuff sometimes gets through. You can try using a coarser grind, but even then there are fine particles that sometimes get through. If the problem persists, try switching to number 4 cone paper filters, which are available just about everywhere. My Ninja is leaking. If it’s coming from the brew basket, make sure all of the components are fit together properly. If the leak is coming from inside or the base of the machine, call customer service (1-877-646-5288). My clock won’t stay on the time. I’ll set it and it will stay for a few seconds and change back to “clock”? My first time on the site wa very helpful. It dcribed some of the dfferences in coffee machines. My family likes brewed ice tea. Does the coffee bar do that? They’ve been buying the gallon brewed sweet tea at WM. Hi Goldie. While the Ninja isn’t advertised as brewing iced tea, you could certainly do that by using tea bags (large ones or multiple single serve ones) in the filter basket. Good luck! 1 month and it will not make a rot of coffee without shutting off after 10 seconds! i did like till it started this 3 days ago. Unfortunately, I have yet to find a solution. I spent a full day cleaning and trying things, then all the sudden it worked again. For 5 months. It started doing it again today, and so far, nothing is working again. 3 hours in, and it’s why I am looking onlne. .. again. My delay brew still won’t work even when power on drip stop open and brew cup pushexback???? My glass carafe broke. Can I replace it with the stainless steel thermal one? This was a very helpful article. I only have one concern I just bought the Ninja single serve coffee bar model cf112. There was no mention of that model. Is this an older or discontinued model? I also have a CF112 machine, 5 months past warranty, that will not make cup of coffee without shutting off after 10 seconds! I did like until this started. I have had machines costing far less last much longer! What a piece of crap! PLEASE anyone considering buying the Ninja Coffee Bar, check out their Facebook page and the endless stream of posts from people who are all having the same problems with these machines!! The Ninja Coffee Bar starts out great, but in a few months they develop an issue where the Clean light will not turn off (Ninja’s solution is to “ignore the light”) and also the water will leak from the machine all over your counter. Ninja claims to be “unaware” of any of these issues. Horrible, horrible product and company. Please do your research and stay away!! I got the unlimited warranty. We have now had 4 of these machines. They all had the same oroblems. The clean light would not go out and then it would not go into cleaning mode or flush mode. After 4 problems I threw it into the trash can and bought a Cuisinart. Now THAT is a coffee maker! Can you please compare the Ninja Coffee Bar to the Delonghi BCO430 All in One Cappuccino Espresso Coffee Maker? Thank you.